Founded in 1943, Speer Ammunition has developed a reputation for their innovative designs and high-performance loads. Today, Speer’s Gold Dot line of ammo is the most trusted duty ammunition for law enforcement personnel across the country. 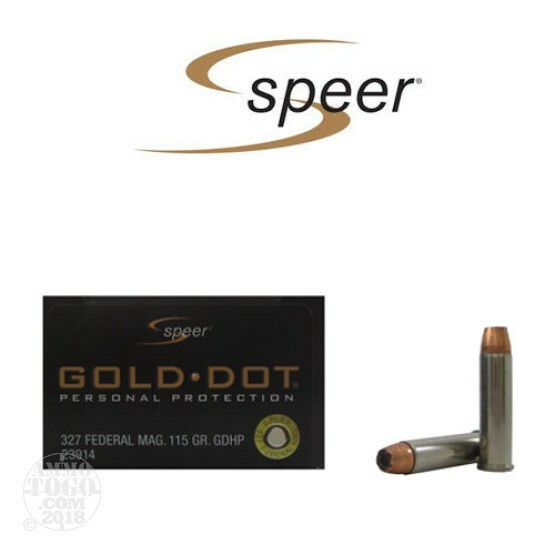 This package contains 20 rounds of Speer Gold Dot .327 Federal Magnum ammunition. Each round is loaded with a 115 grain Gold Dot jacketed hollow point projectile. Formed using Speer’s proprietary Uni-Cor bonding process, the outer copper jacket to the soft lead core molecule by molecule. This forms a strong bond that results in excellent weight retention, optimum terminal expansion, and effective soft tissue penetration. These factory fresh rounds are 100 percent non-corrosive and feature famous CCI primers. The smooth profile of these loads ensures reliable feeding and function in modern semi-automatic handguns. Producing a muzzle velocity of 1335 feet per second, these rounds pack a powerful muzzle energy of 455 foot pounds. A great option for self-defense, Speer Gold Dot cartridges feature nickel-plated brass cases for smooth function, easy loading, and simple low-light chamber checks, as well as low-flash propellants to preserve valuable night vision. I believe this ammo is no longer produced. I was lucky enough to get the last box from my local gun store a few years ago. Testing with the Ruger LCR in water jugs I found that it penetrated 24+ inches (4 water jugs) through 2 layers of denim and expanded to .51". Most likely the reason Speer discontinued this particular round is the over penetration. I load it for self defense as the last round in the cylinder.